India and Bangladesh on Thursday called for working towards finding an alternative crop for tobacco and avoiding interference by the tobacco industry in the welfare programmes. Tobacco farming is a source of livelihood to 4.6 crore Indians. Looking at the disease burden caused by tobacco, the government wants to curb tobacco farming. Zainul Abedin , a fisherman at Chakaria in Cox’s Bazar, worries when the hills erode and come crashing down to fill up the Matamuhuri River. It adversely affects his income. But why the hills eroding and chunks of it come crashing down ever so often! “That happens when you hack down trees on the hills for processing tobacco” Zainul replies to a bdnews24.com question. “That’s why we don’t get fish near tobacco fields,” he added. The fisherman said he often fail to catch fish worth even Tk 30 on some days. 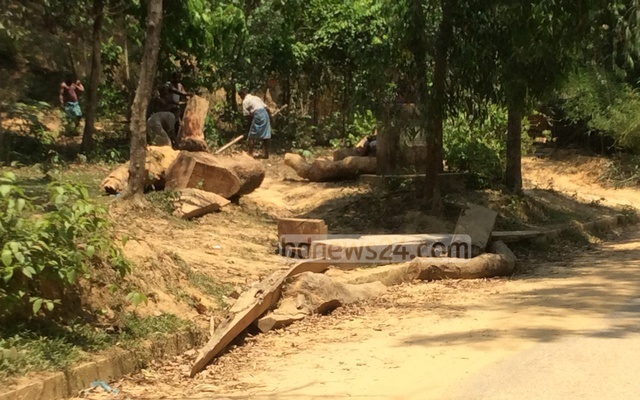 Other locals agreed with Zainul and blamed tobacco processing on relentless cutting of trees. A Tobacco Atlas report has blamed tobacco cultivation for 31 percent deforestation in Bangladesh. Half the forests in south-eastern districts of Bangladesh have been lost to tobacco cultivation in the past century, according to Centre for International Forestry Research. Chakaria resident ‘Mahbub’ said tobacco cultivation has destroyed the forests on the sides of the rivers Matamuhuri and Sangu. 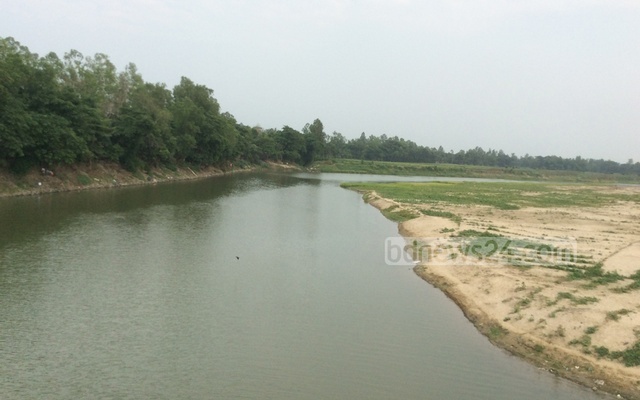 Mahbub had once been known as ‘Pata Mahbub’ (the word ‘Pata’ denotes tobacco leaf in the area) for introducing tobacco cultivation in the area in the early 1980s. He said he left tobacco cultivation after experiencing its negative impact on the forests. “We had countless foxes, deer, monkeys, boars in the forests. Now there is nothing,” Mahbub said. According to non-government organisation Ubinig, tobacco was cultivated on 4,000 acres of land in Chakaria in 2012. Tobacco output from two acres of land need 10 tonnes of wood to burn for processing the tobacco leaves. So around 20,000 tonnes of wood was needed for burning to process the tobacco cultivated that year. A total of 3,838 acre was used for tobacco cultivation in Cox’s Bazar in 2014-15 fiscal, Bangladesh Bureau of Statistics says. 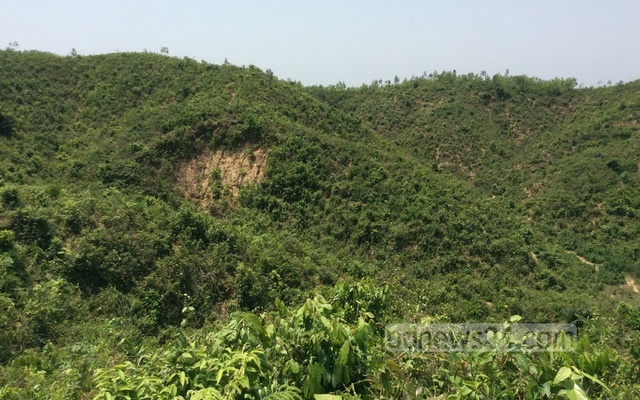 The tobacco planters have not left the hilly forests next to Chakaria. The Department of Agricultural Expansion reports tobacco cultivation was introduced in the hilly districts after 1960s. Anti-tobacco organisation Progga says around 6,000 furnaces to dry up tobacco leaves were set up in Bandarban in 2014. The organisation, referring to the Export Promotion Bureau, says Bangladesh exported tobacco worth $7 million in 2005-06 fiscal. The earnings from exporting tobacco rose to $ 47 million in 2013-14 fiscal year, indicating a huge rise in cultivation. NEW DELHI, June 30 (Thomson Reuters Foundation) – British American Tobacco (BAT), the world’s second biggest cigarette company, vowed on Thursday to investigate some of its supply farms in Bangladesh after a Swedish campaign group uncovered the use of child workers to grow and process tobacco. Swedwatch, which surveyed three tobacco farming districts in Bangladesh, said it found child labour was “widespread” in farms supplying BAT and its local subsidiary British American Tobacco Bangladesh, jeopardising their health and education. “Girls and boys of all ages are responsible for irrigating and leveling the field. Some of them carry loads as well and bring seedlings from the bed to the field,” said the study, which was conducted between July 2015 and May 2016. Swedwatch said children were not only pulled out of school to work for up to 16 hours a day during the harvest season but were also engaged in tasks that exposed them to green tobacco plants, dust from tobacco and smoke from kiln drying. Group Head of Corporate Affairs at British American Tobacco Simon Cleverly told the Thomson Reuters Foundation that the company had investigated the report’s findings, including allegations of unfair contracts to farmers, but found no evidence of any human rights violations. He said BAT’s investigations were consistent with the findings of several independent studies commissioned by BAT to look into tobacco growing and rural livelihoods in Bangladesh that found the company has a positive socio-economic impact. But Cleverly said BAT, the maker of Lucky Strike and Dunhill cigarettes, has asked Swedwatch for details of the farm locations where children were said to be working so the company can investigate further and act if necessary. “We believe this report presents a misleading and inaccurate view of our tobacco leaf farming supply chain in Bangladesh, a country where we have a long-standing history of working with farmers and the government for mutual benefit,” said Cleverly. According to the International Labour Organization (ILO), over five million children aged between 5 and 17 years are engaged in some kind of employment in Bangladesh. For although Bangladesh laws set a minimum working age of 14, poverty causes many families to send children to work. But UNICEF estimates 93 percent of child labourers work in the informal sector, saying this makes enforcement of labour laws virtually impossible. Almost half of working children are believed employed in the farm sector, which is considered the most dangerous in terms of work-related fatalities and occupational diseases due to sharp tools, dangerous machinery, and use of agro chemicals. The Swedwatch report said children working in Bangladesh’s tobacco farms in Bandarban, Chakoria and Lalmonirhat districts were no exception and faced nicotine absorption through the skin as well as pesticide exposure due to no protective equipment. “I cannot sleep or eat regularly and that leads to other health problems. I feel weak,” said one boy, 16, in the report. “When I work in front of the kiln, my eyes burn, I feel pain in my chest and I cough a lot,” he added, describing the process of curing tobacco leaves which involves heating them in a kiln. The study, based on interviews with over 150 people including farmers, government officials, community leaders and activists, also found tobacco work had an adverse impact on schooling and future prospects as children were pulled out of class to work. “The report urges BAT and other tobacco companies to remove the ‘smokescreens’ over their supply chains by publishing impact assessments and third party audits, and to take immediate action to protect people and the environment,” Swedwatch said. Rickshaw puller Kawsar Islam was a chain smoker. But once the health risks from smoking became clear to him, he drastically cut down the number of cigarettes he smoked. He is now seriously planning to kick his addiction for good. The reason? The recently introduced grisly images on both sides of cigarettes packets. Islam, 29, has been smoking for 12-13 years. Like Islam, many in Bangladesh’s capital are now actively contemplating quitting smoking permanently. “I’ve been smoking since around 1972 or 1973,” said an official while enjoying a puff at a roadside tea stall in Dhaka. The official said that despite knowing about the harmful effects of smoking on the body, smoking is a habit hard to quit. But he is also now committed to stop smoking like the rickshaw puller and said he was smoking far less, day by day. There are many like them trying to quit smoking permanently owing to the grisly images on both sides of cigarettes packets. “I’m really appalled to see the gruesome images,” said Islam, who also has a chewing tobacco habit. From March 19, under a new law, the Bangladesh government made it mandatory for tobacco companies to print graphic pictorial warnings covering the upper half of each pack of cigarettes. “Instead of smoking a full packet daily, now I just smoke 2-3 cigarettes,” the official said. “I don’t want to see those hideous images printed on the cigarette packs any more. Some other smokers said they have also been appalled to see the distressing, graphic images of malignant tumors, blackened lungs and mouth cancers appearing on cigarette packages. Anti-tobacco lobbyists in Bangladesh say more Bangladeshis, especially illiterate people who know little about the harmful effects of smoking, will quit smoking when manufactures totally stop marketing all kinds of tobacco products without pictorial health warnings. ABM Zubair, the executive director of an anti-tobacco group named ‘Progga’, said a survey conducted two weeks after the implementation of the new law found that 74.8 percent of tobacco products are still being marketed without any pictorial health warnings. The survey also revealed that health warning labels covered merely a little more than half of the cigarette packages and the number of packets of Bidis with pictorial health warnings was nil, he said. Bidis are hand-rolled thin cigarettes that are popular with the working classes for their affordability. According to the leading anti-tobacco lobbyist, graphic pictures on tobacco packages will be highly effective in discouraging illiterate people from smoking in Bangladesh where about 43 percent of adults are smokers. Zubair further said many countries around the world have already introduced pictorial warnings on tobacco products and it was found later that tobacco consumption had reduced in those countries. Activists allege that the tobacco industry resorts to various tricks to prevent governments from implementing the law that makes it mandatory to carry warning labels with graphic health images of decayed teeth, cancerous mouths and other frightful and highly-visual effects that smoking can have on health. Bangladesh that falls behind the international trend must ignore the “ridiculous” argument of the tobacco industries and implement pictorial health warnings in time to reduce smoking, a global tobacco control advocate says. At least 80 countries have so far implemented pictorial health warnings in the world including neighbouring India, Pakistan, Nepal, Sri Lanka, and Thailand. Bangladesh only recently set the deadline of Mar 19 this year for mandatory display covering top 50 percent of the front and back sides of the packets. But bdnews24.com has evidence suggesting that tobacco industry is lobbying hard to delay the printing of graphical warnings on different pretexts. “Picture warnings are very effective strategy to leave smoking and that’s why tobacco companies oppose them. If they would not work, tobacco companies would not fight so hard,” Rob Cunningham, Senior Policy Analyst of the Canadian Cancer Society, told bdnews24.com on Friday. Canada was the first country in the world that introduced pictorial health warnings in 2001. Cunningham, a lawyer by training, was involved in the process. He said before the Canadian parliament made it mandatory, the tobacco companies were arguing that it was “technically impossible to print colour pictures in cigarette packages”. “But when the parliament made it final, the impossible became possible. It was a ridiculous argument, and they made such kind of arguments in every country,” he said . Cunningham is in Dhaka to speak at the two-day South Asian Speaker’s Summit on the Sustainable Development Goals (SDCs). The summit will begin on Saturday with a special focus on tobacco control campaign. Tobacco control is one of the 169 targets of the SDGs to prevent non-communicable diseases such as cancer and heart diseases. He said the conference was “crucial” as parliaments have “important role” in tobacco control. Cunningham said pictorial health warning was an “inexpensive way” of controlling tobacco use and spreading health education to the people in low-middle income countries like Bangladesh. “The beauty is that they reach every smoker and every day. They also have an impact on people who cannot read,” he said. “If all the countries can do it, Bangladesh can do it,” he said. A new European Union directive will require all 28 member countries to implement picture warnings covering the top 65 percent of the packages, front and back, from May 20 this year. “This is the same company (in Bangladesh), so they can do it,” he said, suggesting the government to ignore industry’s arguments. The tobacco companies in Bangladesh, in violation of WHO’s Framework Convention on Tobacco Control (FCTC), have written to the health ministry to make changes in the provision. A copy of the letter is available with bdnews24.com. The law requires the companies to print the images on the upper part of the pack, which even tax stamp cannot cover. But tobacco companies want to print the warning pictures in the lower part of the pack where they attract less attention. They made their argument through their lawyer Barrister Rokanuddin Mahmud that the tax stamp would cover the warning if it was printed on the upper part. But Cunningham said in many countries where pictorial warning was printed on the upper part, the tax stamp was put on the side. He said Bangladesh had fallen behind the international trend, and “new 50 percent pictorial warning would be a great advance and would have tremendous impact”. Singapore introduced pictorial warnings on tobacco products in 2004, and in a survey a few months later, they found that consumption had reduced by 28 percent. Estimates suggest that 57,000 people die of tobacco-related illnesses every year, and that nearly 300,000 suffer from related disabilities in Bangladesh – a country where nearly 45 percent of the population aged 15 and above consume tobacco in some form.